Acini di Pepe ("peppercorn") is perfect to use in soup recipes. Include them with plenty of vegetables in broths and you'll have a wonderful result. This favorite kid's shape makes any meal fun. Pair alphabet pasta with some vegetables or soup, and your children will enjoy the food. Small rings of pasta. It can be used in soups or in salads with fresh vegetables. There's also a smaller version of Anelli - Anellini. Long, thin noodle with a round shape. It can be used with light sauses and vegetables, as well as with traditional Sicilian sauses. Short cut pasta (also known as "campanelle") with interesting shape resembling a ballet skirt. It can be used in differents types of salads or in soups. Large diameter (about 3 mm) and very long-cut spaghetti, made with wholemeal soft wheat flour. It is perfect in a variety of Sicilain dishes. This pasta is shaped like thick Spaghetti, but is hollow in the center. It's perfect for any sauce, or it can be baked in casseroles or stirfried in dishes. Cannelloni are a short-cut pasta tubes, perfect for dishes with vegetable sauce, casseroles and certainly for stuffed recipes. This pasta is shaped like a very narrow, twisted and rolled tube. It is best used when served with chunky sauce and in a veriety of casserole dishes. The tight spiral locks-in the flavor, which makes it perfect with any kind of sauce. Also, "corkscrew" is good to use for pasta salads. These shapes are best served with thick, chunky sauces or in pasta salads. Also, it pairs perfectly with meat, cream, seafood or vegetables. These shells can be small (perfect for soups and salads), medium, and large (best served stuffed with a mixture of cheese, meat and vegetables). Coquillettes pasta has a short-cut extruded shape. It is best used inside dishes with vegetable, cream or meat sauce. This short-cut pasta is shaped like creste di galli ("cockscomb"). Creste di Galli pasta is best used for salads or soups. This short-cut pasta resembles a shape of discs. Also known as "Messicani" or "Dischi Volanti", it is best suitable for casseroles or salads. ("Little Thimbles") This versatile shape can be used as the base of any dish. Bake it, stir it into soups, or create great salads and stir-fry dishes. A highly versatile shape of this kind of pasta can be topped with any souce, baked, or put in soups, salads and stir-fry dishes. "Butterflies" brighten any meal with their interesting shape. Thick enough for different sauces, and a perfect addition for salads and soups. This thick ribbon-like pasta is often paired with thick meat-based sauces. One of the most popular pasta recipes is the rich fettuccine alfredo sauce. Short thin strands of pasta that are slightly curved. Fideo is commonly partners with veggies and lean proteins to be used in soup recipes. This spiraled shape can be topped with any sauce, added to soups, or turned into a beautiful salad. Fusilli also bakes well in casseroles. Twins add a touch of style to any dish with this distinctive shape. Gemelli pairs nicely with meat, cream, seafood and vegetable sauces. This wide flat-shaped pasta is one of the oldest types of pasta. It is perfect for casseroles with vegetables, cheeses and any sauce. ("Little Tongues") It's a great shape to complement a variety of sauces. Also, a good choise for salads, stir-fry dishes, and certainly for seafood. This flat wide ribbon pasta is similar in shape to the lasagne noodle but with a slightly narrower in size. Can be both in short and long lengths. ("Small Muffs") Stuff Manicotti with a mixture of meat, cheese and vegetables, top with your favorite sauce, and bake. Very delicious! The shape of this pasta resembles little ears ("Orecchiette" in Italian). This pasta is served with thick chunky sauces or in salads. This small, grain shaped pasta can be topped with any sauce, added to soups, or baked as casserole. Perfect as a side dish as well as a main course. This pasta is usually cut into a broad ribbon shape. It's width is between lasagna and tagliatelle. Pappardelle is great with heavy rich souces. 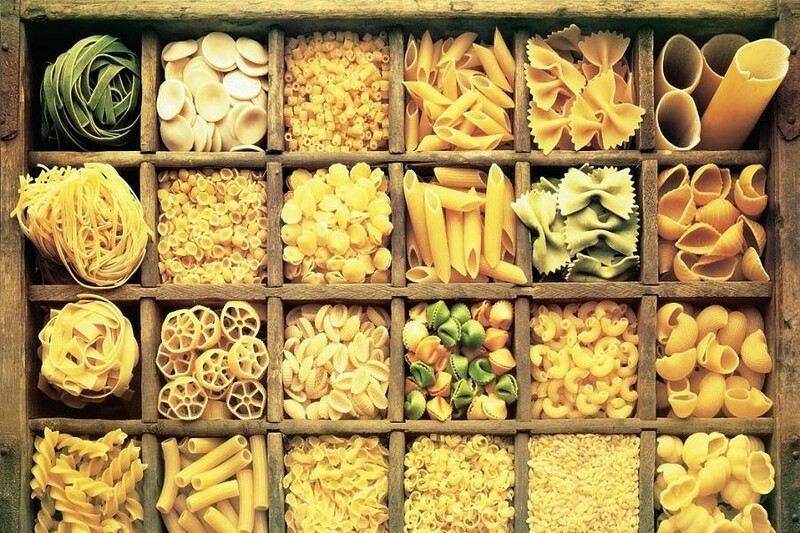 In Italy, this super tiny pasta is commonly used as a dietary food. Italians traditionally put pastina into soups, or eat it with olive oil and cheese. Penne complement virtually every, especially chunky sauce. Penne pairs nice with meat, chunky vegetable, cream sauces, and perfect for baking. ("Small Mustaches") This tubular pasta complements a veriety of sauces, is oftenly used in salads, casseroles, or made into stir-fry dishes. This kind of penne is ridged and ideal to lock-in flavor. This pasta pairs nicely with meat, chunky vegetable, or cream souce, and perfect for baking. A hollow curved pasta that resembles a snail shell. This shape pairs nicely with meat, chunky vegetable, cream, or oil based sauces. This ruffled, ridged shape adds elegance to any sauce. It also works well baked in casseroles, and oftenly used in salads and soups. Ravioli are square round pillows of pasta that have a filling of such ingredients like cheese, meat, vegetables and seasonings. Reginette is wide, flat ribbon pasta that has rippled edges on both sides. Perfect with meat, vegetable, cream or oil based sauces. Riccioli's twisted shape holds bits of meat, vegetables and cheese, so it works well with any sauce, as well as in salads, casseroles, or stir-fry meals. ("Large Grooved") Rigatoni's ridges and holes are perfect with any sauce, from cream or cheese to the chunkiest meat sauces. In Italian "rocchetti" means "spool". This short kind of pasta is perfect for preparing casseroles, as well as inside pasta salads. The cartwheel shape makes this pasta very popular. This shape is good for lock-in flavor, and pairs nicely with meat, cream, seafood and veggies. The spirals shape holds bits of meat, vegetables and cheese, so it works well with any sauce, as well as inside salads, casseroles, or stir-fry meals. ("A length of cord") Perfect choice for nearly any sauce, as well as for casseroles or stir-fry dishes. One of the most popular kinds of pasta. Long and ribbon-like in shape, very similar to fettuccine. It can be served with an array of sauces, but a classic meat sauce tends to be the best fit. Very similar to vermicelli. Each one is slightly thinner than spaghetti. Thin spaghetti is perfect topped with any sauce, or in salads or stir-fry dishes. Tripolini is a tiny bow tie-shaped pasta. Tripolini is oftenly used for pasta salads, soups, and paired with a simple sauce. A medium-sized, tubular pasta shape, Tubulini is perfect for chunky sauces and meat dishes, as well as for salads, stir-fry meals and casseroles. ("Little Worms") Slightly thinner than spaghetti, Vermicelli is good topped with any kind of sauce, or as a salad or stir-fry ingredient. ("Bridegrooms") A medium-sized, tubular pasta, Ziti is perfect for chunky sauces and meat dishes, as well as for salads and casseroles.